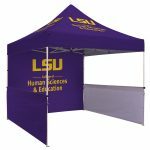 Customize Tents that are easy to set-up with crank-up canopy and stability is what our customers are requesting from us like this Custom Tent that we did for our client at LSU. We suggest to our client that when purchasing a tent or tents to consider these benefits for a 10′ x 10′ Premium Tent the most durable easy crank-up canopy for easy to set-up, rust free, anodized aluminum frame with unique hexagon shaped legs and a 5-year warranty. High quality, flame retardant, weather resistant, 400 denier UV polyester canopy. 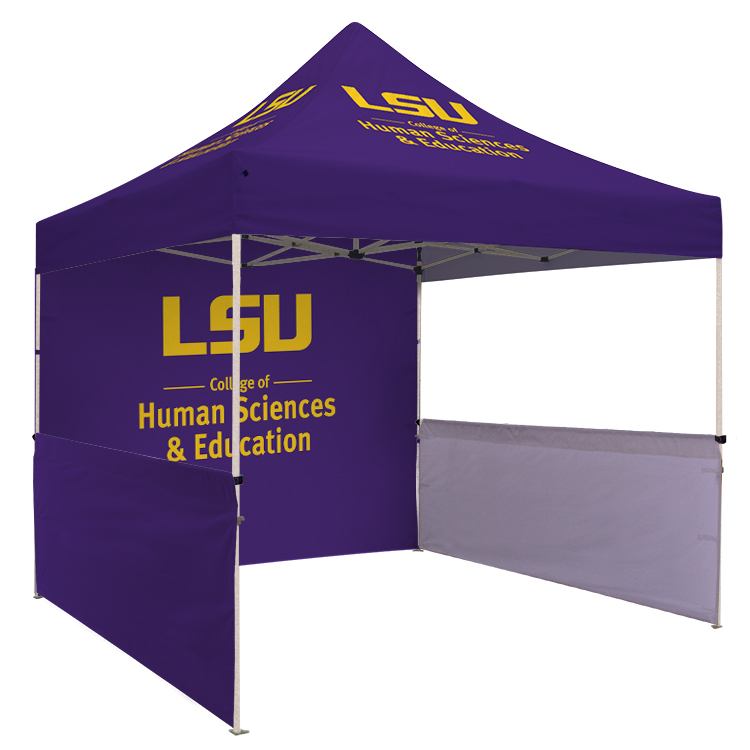 Our client at LSU wanted a soft case with wheels so that the tent is easy to travel for tailgating events, sporting events, festival or recruiting. In addition, our art team presented the client at LSU with several Virtual’s with their creative design on the top of the canopy on all 4 sides, back wall double sided imprint and two side walls printed with their logo design. The client ultimately decided to purchase the Premium Tent at LSU. This client sent us a photo of the LSU tent and said: Here is a picture of the tent in action… it worked great, the tent was awesome for our events. Read moreTents for All Occasions!